2014 marked the 50th anniversary of the Smithsonian American Art Museum/National Portrait Gallery Library being organized into the branch collection that exists today. Although collections of material on art have existed since the early 1920s, primarily to support the National Gallery of Art at the Smithsonian (which later became the National Collection of Fine Arts (NCFA), and is now the Smithsonian American Art Museum), it wasn’t until after the United States Congress transferred the Patent Office Building to the Smithsonian with the intent for it to house the art museum and the National Portrait Gallery (NPG), that the library was organized into its current collection. The original Smithsonian American Art Museum/National Portrait Gallery (AA/PG) Library was located in the third floor of the west wing of the Patent Office Building. The original space was completed in 1857 and served as a hall that housed models that were submitted with patents. Twenty years later during the fire in 1877 the hall was destroyed and the replacement, designed by the architect Adolf Cluss, who also designed the Smithsonian’s Art and Industries Building, was reconstructed from 1879 to 1881. The finished space had 3 tiers with a skylight above the central aisle. With increased space constraints, by the early 1900s the west model hall was converted into the Patent Office’s public search room. In 1932, the Patent Office moved out of the building which was then occupied by the Civil Service Commission. After a threat to demolish the Patent Office Building in 1953 was met with opposition pointing to its historic and architectural significance, the building was transferred to the Smithsonian in 1958. Under the guidance of Secretary S. Dillon Ripley, it was decided that the building would house the NCFA and the newly-created National Portrait Gallery. Renovations began in late 1964, and the third floor west hall was chosen as the space to house the library for both museums. A new librarian, William Walker, was hired in 1964 to organize the new library, which absorbed the collections of art books and materials in various Smithsonian buildings. The collection was first organized and housed in the Art and Industries Building. The librarian developed the collection for the two museums and helped design the library in the new space in the newly-named Fine Arts & Portrait Gallery Building. In February 1967, the library moved into its space in the west hall while construction continued. Shelving was completed in April 1968 and the collection moved from its prior location to the new stacks in later 1968. 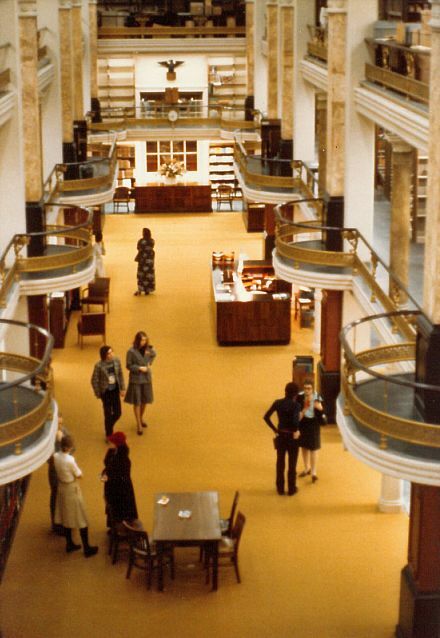 With the addition of antique gold carpeting over the damaged marble floors, the library space was completed in time for the opening of the National Portrait Gallery in October 1968. Head Librarian, Bill Walker, continued to develop the collection and worked to establish the library as a center of study for the field. After 15 years he left to become the Chief Librarian at the Metropolitan Museum of Art and was succeeded ultimately by Cecilia Chin in 1982. The west hall continued to serve as the location for the library until 2000 when the museum was closed for a major 6-year renovation. 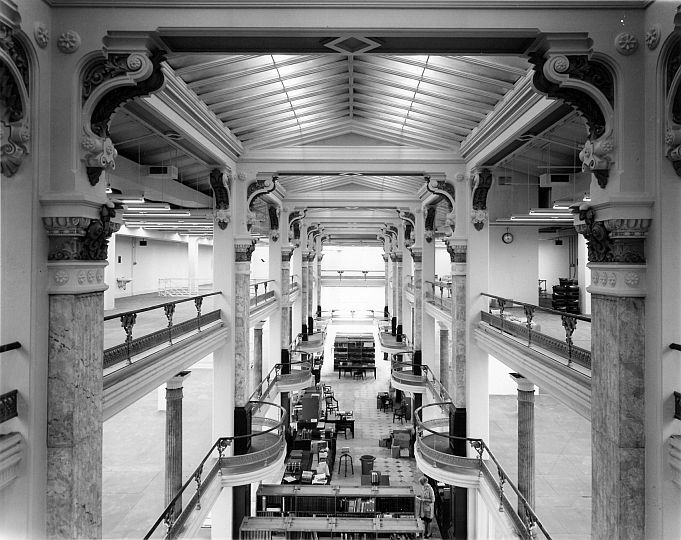 The library was moved to its present location in the Victor Building and the space now currently houses the Luce Foundation Center for American Art. To commemorate the 50th anniversary of the AA/PG Library, photographs of the history of the west hall of the Patent Office Building and its renovation into the library have been put on display in the AA/PG library. Visitors are welcome to visit during the library’s public hours. Selamat dan salam sukses selalu. Ulang tahun yang ke 50 Perpusatakaan.